Smoky Mountain Jetboat Rides are a popular attraction on the 400 foot-deep Fontana Lake. Riders are thrilled to experience the boat’s trademark Hamilton spins – a flat spin within the boat’s own length. 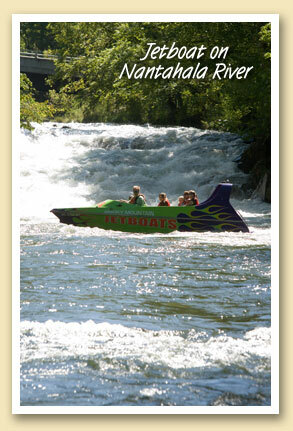 Yet the biggest surprise may come when the 11-passenger craft ventures up the relatively shallow Nantahala River to the base of Wesser Falls. How is this possible? Drawing just four inches of draft, the New Zealand-style jet boat rides like a ski on the surface of the water, enabling it to go where no other speed boat would dare go. In addition to providing safe and thrilling rides, Smoky Mountain Jetboats also manufactures the boats in their Bryson City plant. Each evening, Monday thru Saturday, Mort and Lainey White’s Hemlock Inn serves a tasty smorgasbord of down home southern cooking served family style at large round tables with lazy Susans. 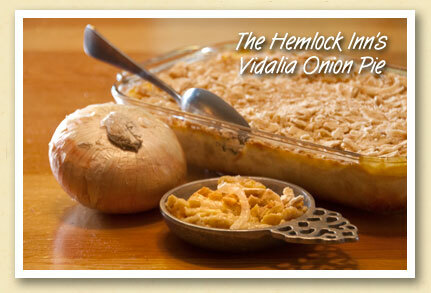 Of the dozens of dishes they serve, one of the most requested is the sweet and savory casserole shown above — the Bryson City Inn’s signature Vidalia Onion Pie. Melt margarine and pour half into the crushed crackers. Blend well. Save enough cracker crumbs to sprinkle over top. Press cracker crumbs into pie pan. Slice the onions thin and saute in remaining margarine until tender but not brown. Put onions on the pie crust and pour over white sauce to which the sharp cheese has been added and melted. Sprinkle a few cracker crumbs over top and bake in 350 degree oven for about 15 minutes. Serves 8. In heavy saucepan, melt butter. Stir in flour, and slowly add milk. Stir constantly with whisk until thick. Yield: 1 cup. With supermarket strawberries available year ’round, it’s easy to forget the taste of fresh-picked, locally-grown berries. But May is the time to enjoy the real thing. In the Bryson City area, two local growers have fields where you can pick your own or purchase containers of freshly-picked berries. Above, Brynnae Rhinehart of Bryson City samples a berry at Darnell Farms, just east of Bryson City on Highway 19. The other is Shelton Family Farm on Thomas Valley Road in Whittier. 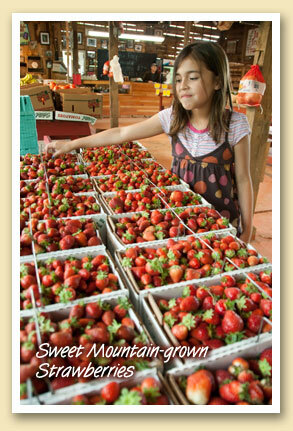 Products made from locally-grown berries are also appearing on Bryson City’s retail shelves. Molly Shaw is an elementary school teacher whose award-winning strawberry jam is available at the Cottage Craftsman and the Fryemont Inn. And an area winery, Calaboose Cellers, uses local berries in their “Up The River” strawberry-rhubarb wine, which is served onboard the Great Smoky Mountains Railroad excursions, and is available at the Cottage Craftsman. 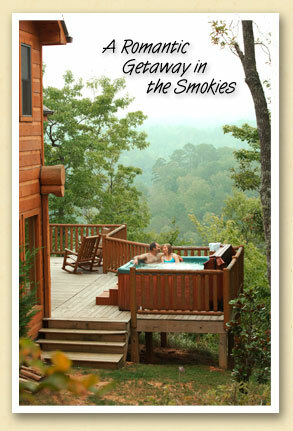 With all there is to do in the North Carolina Smokies, sometimes the best getaway involves doing next to nothing. 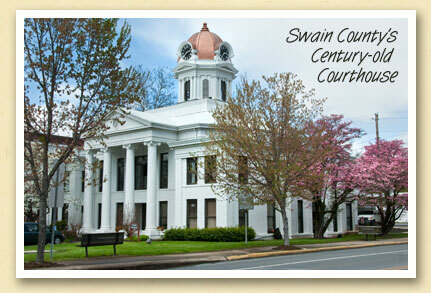 Constructed in 1908 and used by the County until 1980, the historic Swain County Courthouse was added to the National Register of Historic Places in 1979. The building was designed by Frank Pierce Milburn and R. S. Smith. Milburn was a prolific architect of the late nineteenth and early twentieth centuries who designed major public buildings in almost every southern state. His work ranged from county courthouses to state capitols, including the South Carolina State House and the old Florida Capitol. Smith worked in Asheville, first with Richard Morris Hunt at Biltmore Village, and then independently. Falls City Construction Company, of Louisville, Kentucky, built the structure in just six months, at a cost of approximately $35,000. Records show the commissioners authorized the company to get “a tower clock with metal Bell for a cost of $850”. Today, the first floor is used as a senior center by the State of Franklin Services. And yes, the clock and bell still work.